Should we Ban/Restrict Rifles? Or Hammers? Or Hands? 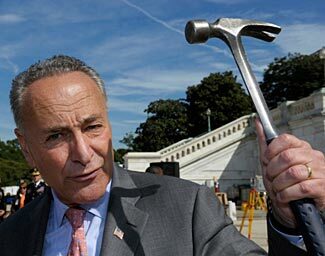 Gun-hating Senator Schumer with a hammer. Where is his outrage over hammer murders? What hammer controls does he propose? The sheep are predictably bleating in response to the Sandy Hook School shooting. Ban this! Restrict that! Outlaw the other thing! The gun grabbers are leading this chorus with glee, while the sheep rush to sacrifice not just their liberty and freedom but also yours and mine too; all in the naieve ridiculous hope that the bad guys will voluntarily also sacrifice their liberty and their freedom. Most of the focus seems to be on restoring the useless ban on ‘assault rifles’ (although Senator Feinstein’s definition of ‘assault rifle’ for her ban provision would also include any pistol capable of having a greater than 10 round magazine, which means just about every modern semi-auto pistol). There’s something about the sight of a modern sporting rifle that creates a knee jerk hate response with gun banners – it seems they wish that only guns that ‘look nice’ with gentle curves and pastel colors should be allowed. But – let’s stop a minute and smell the roses. Just how many people are killed by rifles each year? The answer might surprise you. As reported here, the FBI uniform crime statistics show that in a typical year, about 300 – 450 murders were committed with a rifle. But – in the same typical year, more people are killed with hammers than with rifles. For example, in 2011 (the most recent year for statistics) there were 323 people killed by rifle, and 496 people killed by hammers and clubs. A typical year shows half as many people again killed by a hammer or club than by a rifle. And – get this – a typical year also sees twice as many people are murdered with nothing other than the killer’s bare hands (see this table for five years of recent data). And don’t get us started on the slaughter from knives and cutting instruments – four to five times greater than that from rifles. So, where is the outrage against hammers and clubs? Against knives and cutting instruments? What restrictions are being mooted against a person’s bare hands and feet? Should there be a ban on hammers weighing more than 1 lb? What about people with large hands or strong legs? Should they be required to have surgical alterations? We urge you to write your representatives and point them to these statistics and ask them to prioritize their actions to reduce violent crime. Why focus solely on rifles when they are a small part of the problem, and already subject to dozens if not hundreds of rules and restrictions? Why should honest people have their access to rifles restricted, when dishonest people will ignore any new laws and restrictions, the same as they have ignored all the previous restrictions that already exist. By focusing on the tool – be it a rifle, knife, hammer, or even a killer’s bare hands – we are avoiding focusing on the real root cause, which is human nature and the propensity for bad people to do bad things, whatever way they can.